Nestled between a diner and one of Shrewsbury’s many antiques shops sits the Village Coffee and Cream, a quaint ice cream and beverage shop whose influence spreads farther than the cup. In 2015, Shrewsbury Antique Center owners Diane Kraatz and John-Paul Whitmore saw a need in the community for a place where people could relax. From their own antique shop experience, they noticed that potential customers had nowhere to sit and consider buying a piece of furniture. “A lot of people come in here to think about a purchase from another store, and if you let them leave the area, they won’t come back,” says Diane. “So, it catches them here; it gives them a place to relax.” With the support of the neighboring businesses, Diane and John-Paul decided to convert what once was another antique shop into a place for a one-of-a-kind coffee and homemade ice cream shop. Diane and John-Paul’s cozy shop not only caters to the coffee drinkers of the town, but also to the other businesses. They try to cross-market the area by sending their customers from the Antique Center to the Village Coffee and Cream and vice versa. Due to their encouragement, they have allowed visitors to see all the best parts of Shrewsbury. “We wanted to bring back the village,” says Diane. “We needed to make an area a place to visit versus a one-stop shop. The more things to do, the more attractive it becomes.” On their billboard along I-83, the Village Coffee and Cream advertises to prospective travelers not only for their business, but also for the shops on Main Street. 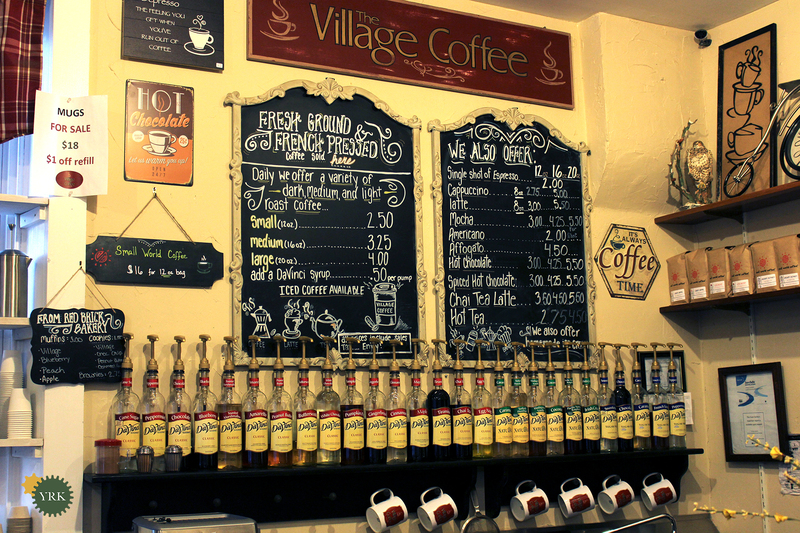 The Village Coffee and Cream’s community support expands the boundaries of the borough. They use apples from Uglie Acres of Windsor in their autumn ice cream and import pastries from the Red Brick Bakery in Red Lion in an effort to involve more of York County in their business. In addition to the food and drink, the Village Coffee and Cream is a place for artisans. An on-site jeweler works with necklaces, bracelets and rings — all displayed next to the ice cream. The rooms and halls decorated with locally made arts and crafts ready to be purchased add to the creative atmosphere of the building. Keep up-to-date with the newest events and flavor changes by following the Village Coffee and Cream on Facebook, and visit the coffee shop on North Main Street in Shrewsbury.